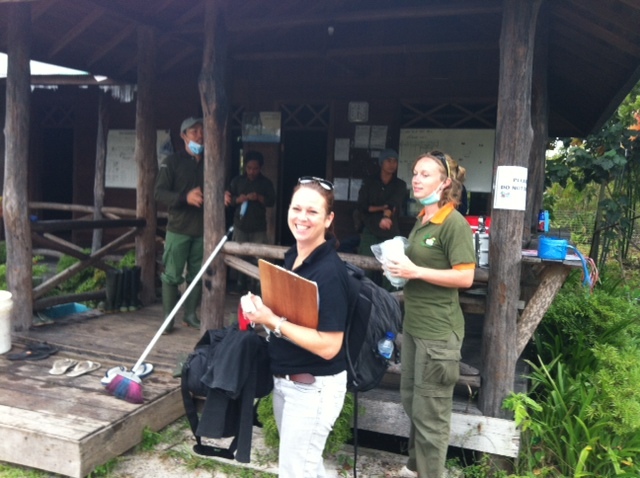 Update from the Forest: The Monitoring program begins! Returning after dark from day 1 of monitoring Tarzan, Astrid, Monic and Tantri, Scientific Advisor Simon Husson reported by satellite phone yesterday at 18.25 that all the orangutans were successfully followed by the monitoring teams until they made their nests for the night. Astrid, who had bolted out of her cage when Program Manager Anton Nurcahyo opened the door, continued her tree climbing in various trees and made several nests before finally settling down for the night. Monic followed Astrid closely and the two were also joined by Tantri. All the girls made quite a few nests as didn’t appear to be satisfied with their first attempts, however by night fall all were settled, nesting close together. We are hoping that they will stick together while they familiarize themselves with their new forest home. As for Tarzan, he climbed up and up until he finally found a good resting place for the night. All the orangutans need a very good nights sleep ready for a fully day of foraging tomorrow. Sleep well all. Tantri, Monic, Astrid and Tarzan are Home! 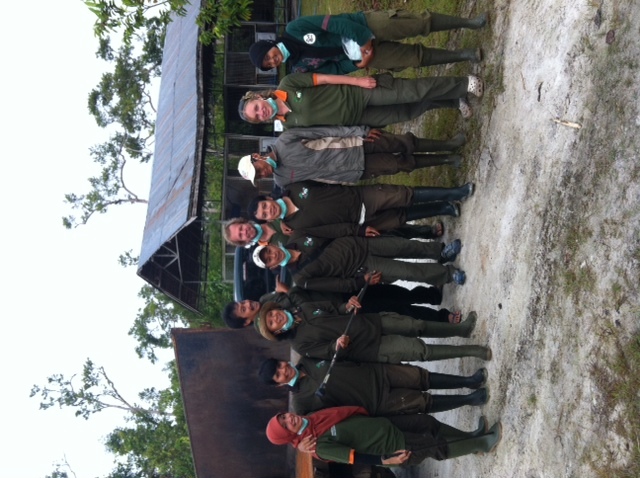 Tuesday February 28, 2012, at around 10 am, the Release Team waited by the helipad in Bukit Batikap Conservation Forest, ready for the arrival of the first two orangutans, Tantri and Monic. The Village Chief of Tumbang Tohan – the nearest village from our camp – and several Dayak cultural leaders also waited with us, eager to witness this first release. After waiting for almost an hour, we heard the sound of a helicopter high above us. And soon enough, it landed smoothly. Appointed technicians approached the helipad after it stopped completely. On this flight, Tantri and Monic were accompanied by vet Agus Fahroni and technician Ahmad Syarief, and also Jacqui Sunderland-Groves, our Senior Advisor to CEO, Planning, Monitoring and Evaluation. 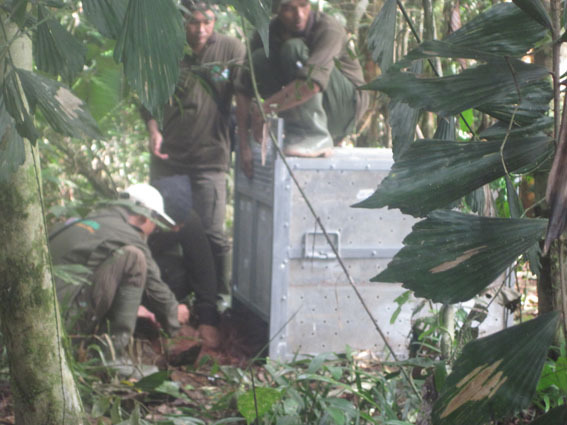 The technicians carried Tantri’s and Monic’s transport cages to their release points in the forest. Agus opened Tantri’s cage first because she is the youngest among all the candidates. Tantri’s first expression was so touching. She didn’t climb a tree immediately. Instead, she climbed on top of Monic’s cage that was located not very far from her, and sat there for a brief moment. She looked around in amazement as if to say, “Forest! I’m free! Or am I dreaming?”. Tantri didn’t wait for long though and to ensure she wasn’t dreaming, she climbed up the nearest tree and sat happily in the forest canopy. 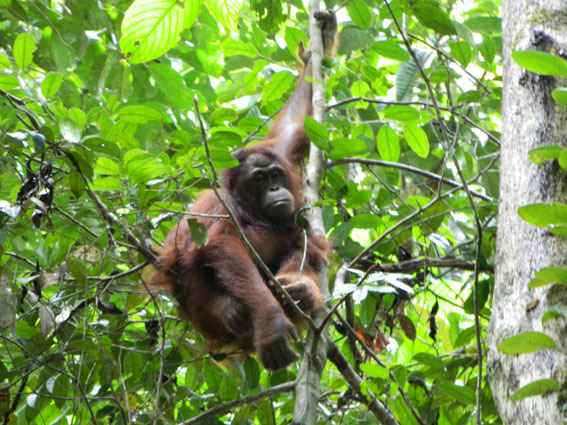 After seeing Tantri safe and happy in a tree, it was Monic’s turn to be released. Agus opened her cage. Unlike Tantri, Monic wasn’t confused at all. She immediately chose a tree, not far from Tantri’s, and climbed up and up. Then, she chose a branch to finally rest after that long and tiring journey. Monic didn't hesitate and immediately climbed up a tree. 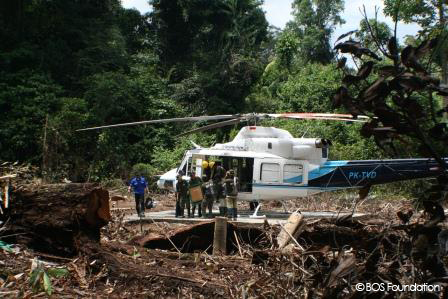 The same helicopter returned to pick up Astrid and Tarzan from the IMK helipad, located close to Puruk Cahu, and flew them to Bukit Batikap. It landed at Bukit Batikap around 1.30 pm. Accompanying the two orangutans were vet Maryos Vigoury Tandang, technican Taufik, Nyaru Menteng Program Manager Anton Nurcahyo and BOS Foundation’s CEO Dr. Jamartin Sihite. Wasting no time at all, Astrid was carried to the release point in the forest and Anton opened her cage. Just like Monic, Astrid showed no sign of uncertainty and happily climbed up a tree right away. Last but not least, we returned to the helicopter to bring Tarzan home. The team had decided that Tarzan, who is an adult male, would be released a bit further from the first three younger females to give him more time to adjust to his new environment. Arriving at his release point, Tarzan had not fully recovered from the sedation and was still asleep. Vet Agus finally decided to give him a sedative reversal to wake him up and not long after, Tarzan started to move his hands. Unfortunately, the helicopter pilot had called passengers to board as dark clouds started to approach. Some of us had to go. We could feel tears of joy on each of our faces. Tantri, Monic, Astrid and Tarzan are home! Good bye, our friends. Thank you for the unfortunate yet incredible chance to get to know all of you. Take good care of yourselves in the forest and rest assured we’ll be keeping a watchful eye over you all! It’s done. 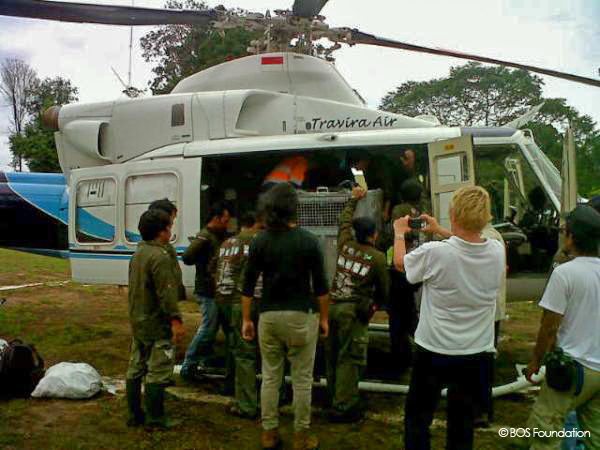 Finally, Monic, Tantri, Astrid and Tarzan safely landed at Bukit Batikap Conservation Forest. Finally, Tarzan and Astrid are flying to Bukit Batikap. In an hour they will finally back to the place they should be. We will update you with more good quality photos of the release as soon as possible. BOS Foundation in cooperation with the Ministry of Forestry Republic of Indonesia, the Government of Central Kalimantan Province, the Government of the Murung Raya Regency and Conservation and Natural Resources Authority of Central Kalimantan (BKSDA Central Kalimantan) will release 4 orangutans in Bukit Batikap Conservation Forest on February 28, 2012. These 4 orangutans are part of 40 orangutans that have been planned to be released in the year 2012. Central Kalimantan, February 27, 2012. After more than a decade during which the release operation at Central Kalimantan Orangutan Reintroduction Project at Nyaru Menteng (The Borneo Orangutan Survival Foundation) could not be realized due to the decreased amount of available secure and ecologically suitable forest, today the Governor of Central Kalimantan, Agustin Teras Narang sent the Release Team from the Borneo Orangutan Survival Foundation, from Tjilik Riwut airport, Palangka Raya heading to Puruk Cahu. From Puruk Cahu, the Release Team will then go to Bukit Batikap Conservation Forest where four orangutans will be released the following day, February 28, 2012. “The effort and the provision of land is part of the commitment of the Provincial Government, in cooperation with the relevant Murung Raya Regency Government. Additional efforts are being conducted jointly between us, in favor of allocating forest to ecosystem restoration concessions which can be used as a place to release orangutans, especially those orangutans situated at the Central Kalimantan Orangutan Reintroduction Project at Nyaru Menteng,” said Agustin Teras Narang, Governor of Central Kalimantan. 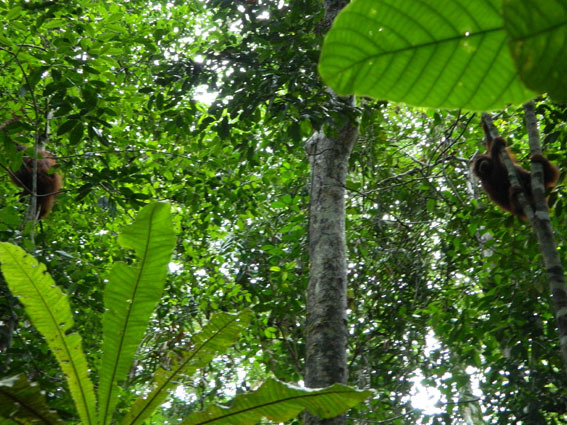 Moreover, orangutan conservation efforts require high commitment and cooperation from all of the stakeholders in the enforcement of laws on the protection of orangutans. “If it is unavoidable, do not act alone, because it is breaking the law. Please cooperate with the BOS Foundation and Conservation and Natural Resources Authority of Central Kalimantan (BKSDA Central Kalimantan) to work together and find solutions,” adds the Governor. Release operations will not stop here. 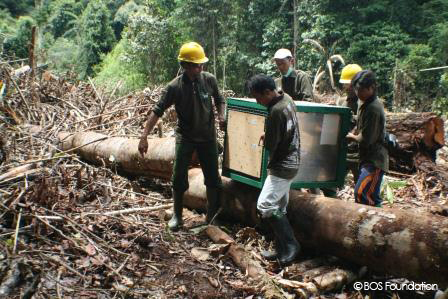 In the end of March 2012, BOS Foundation plans to release 12 more orangutans and it will be done continuously. There are still more than 600 individual orangutans at the Central Kalimantan Orangutan Reintroduction Project at Nyaru Menteng who are waiting to be released back to their natural habitat. If there is more suitable land available, the orangutan release efforts will be continued so that by 2015, the goals set in the Indonesia Orangutan Conservation Action Plan 2007–2017, proclaimed by the President of the Republic of Indonesia in the Climate Change Conference in Bali in 2007, which states that all orangutans in rehabilitation centers should be returned to their habitat not later than 2015, will be accomplished. “All of the healthy and able orangutans in rehabilitation centers should be returned to their natural habitat at the latest by 2015. After the release of these 4 orangutans, in the end of March BOS Foundation will release 12 more orangutans. This should be supported with the availability of a viable forest. The role and support of our Country’s Government, especially the Government of Murung Raya becomes very important in this matter,” Dr. Jamartin Sihite, Director of the BOS Foundation said. 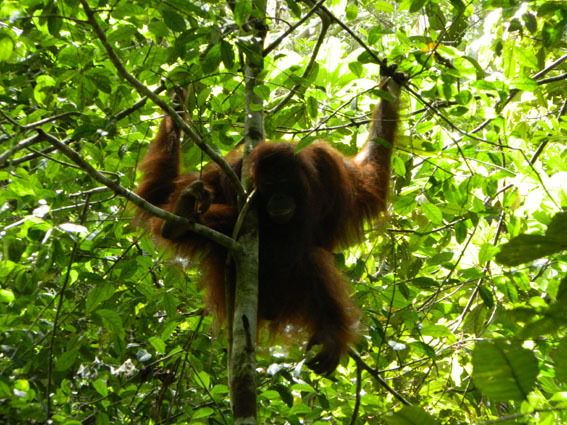 “In addition, if the release of orangutans can be done within conservation areas which have been allocated by a company that owns a concession license in Murung Raya, that company is supposed to be open and cooperate with the Government of the Regency, BKSDA Central Kalimantan, the Provincial Government and NGOs,” he added. In supporting the release operation, IndoMet Coal said it was pleased to be partnering with the BOS Foundation, through its Kalimantan Conservation and Sustainable Development Project, to provide logistical and technical support for the safe release of these orangutans. “IndoMet Coal’s objective is to establish a successful business, which operates safely, responsibly and sustainably. Our program of orangutan support activities clearly demonstrates our commitment to conservation and sustainable development,” Rock Funston, IndoMet Coal Project Director said. Dr Sihite also added that in addition to supporting BOS Foundation through its involvement in the IndoMet Coal Project, PT Adaro Energy Tbk is supporting this release. “We always strive to fulfill our commitment to the surrounding environment in our operational activities and support biodiversity. And it’s an honor for Adaro Energy to be part of this project,” said Garibaldi Thohir, President Director PT Adaro Energy Tbk. Beside those two mentioned organizations, Fauna and Flora International is also supporting the BOS Foundation on this release operation. “FFI is pleased to see the first positive results of partnership between BOS Foundation, BHP Billiton, PT Adaro Energy Tbk and FFI providing encouraging news for orangutan conservation and a demonstration of the commitment from the Government of Murung Raya Regency to work towards balancing regional development and conservation.” Godwin Limberg, Project Manager of Fauna and Flora International, added. 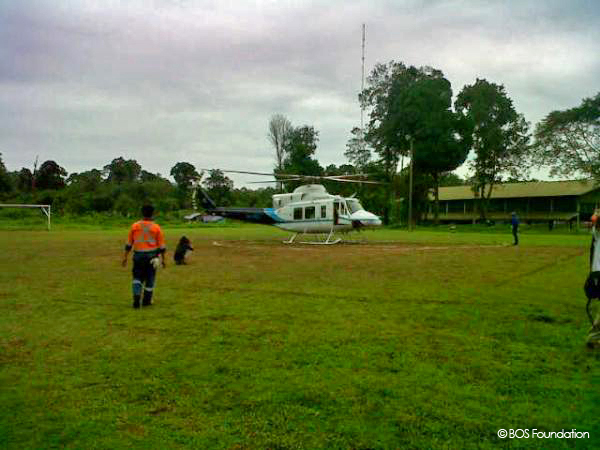 Those 4 orangutans will fly to Bukit Batikap by Helicopter from a helipad owned by PT Indo Muro Kencana. 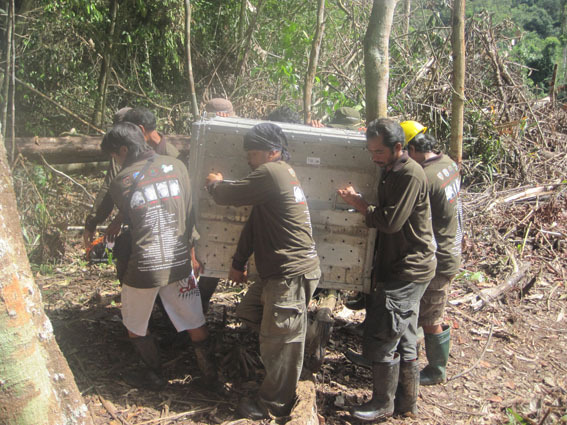 There also, the BOS Foundation put some transit enclosure for the orangutans to stay one night before the release day. The BOS Foundation has been working together with PT Indo Muro Kencana since 2007. This activity cannot be separated from the role of cooperation between the BOS Foundation, the donors, the Government of Central Kalimantan Province, Murung Raya Regency and BKSDA Central Kalimantan with the full support of the Central Government in this regard the Ministry of Forestry. Tarzan, Astrid, Monic and Tantri are halfway home! Today was an amazing day for the whole team and as of now we can happily report that the orangutans are already half way home! The day started at 6 am in Midway, which is our second facility at Nyaru Menteng and the site where our quarantine facility is located. 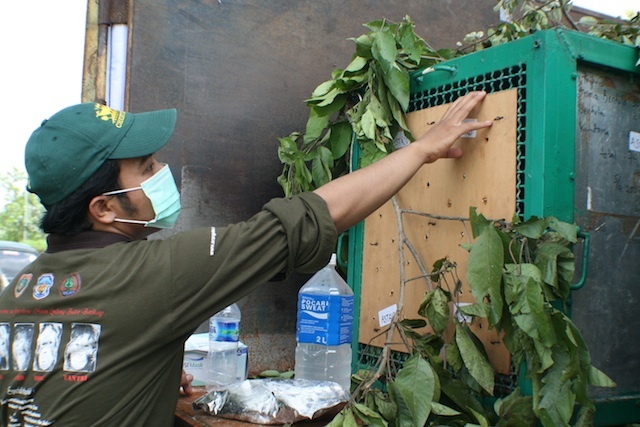 Like all our release candidates, Tarzan, Monic, Tantri and Astrid must complete a strict quarantine period in order to ensure they are completely healthy before they go to the forest. 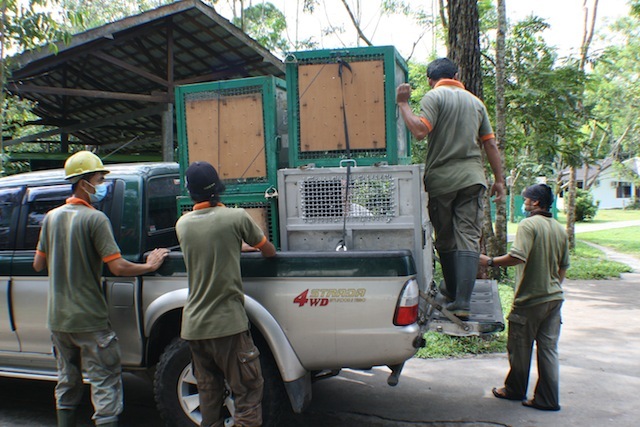 Our experienced team of vets and technicians successfully moved the orangutans into transport cages to enable their journey to begin. The orangutans were transported by road to the VIP Room at Tjilik Riwut Airport where a leaving ceremony was held in their honor. During all the preparations and travel, great care was taken to ensure they were comfortable and constantly monitored. The leaving ceremony was presided over by the Minister of Forestry, the Vice of Governor of Central Kalimantan on behalf of the Governor, the Regent of Murung Raya District, the Head of BKSDA and many other important government representatives. A very special goodbye indeed for our orangutans! 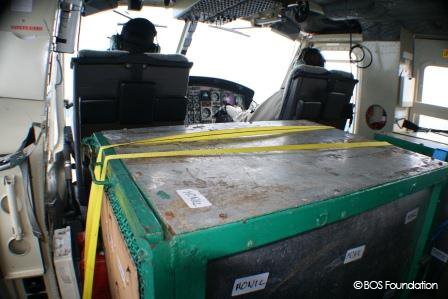 Directly after the ceremony, the orangutans were loaded on to a small plane and transported together with the release team, including vets drh. Agus and drh. Maryos, to Puruk Cahu. This is only a 55 minutes journey and the orangutans behaved perfectly. On arrival in Puruk Cahu our ground team were standing by to meet us with vehicles and support from the staff at IMK, enabling us to immediately transport Tarzan, Astrid, Monic and Tantri to our transit enclosure located within the IMK compound. The technicians and medical teams, supported by the rest of the BOSF staff on site successfully introduced our orangutans into our transit enclosures despite the fact that it took 7 of us to help Tarzan safely enter his enclosure. Tarzan is a very large adult male and although sweet natured, still possesses the skills needed to survive in the wild and doesn’t appreciate being the center of attention by his human caregivers. Tarzan, Astrid, Monic and Tantri are safely settled into our transit enclosures at Puruk Cahu and tomorrow morning, after a ceremony with the Regent of Murung Raya, they will fly to Bukit Batikap by helicopter. They will finally going home. Wish us luck. They are Finally Going Home! After months of detailed planning we are drawing very close to beginning our release program! 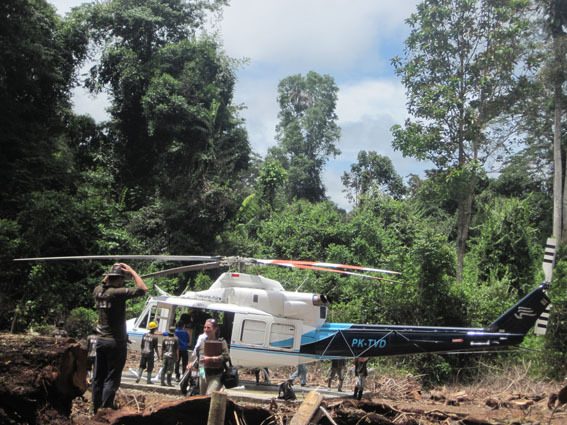 Our field team are already in Batikap preparing for the arrival of the orangutans and this morning the helicopter successfully landed in Batikap so the pilots could check the helipad and landing conditions at our camp site. The only way we can get orangutans into Batikap is by helicopter. 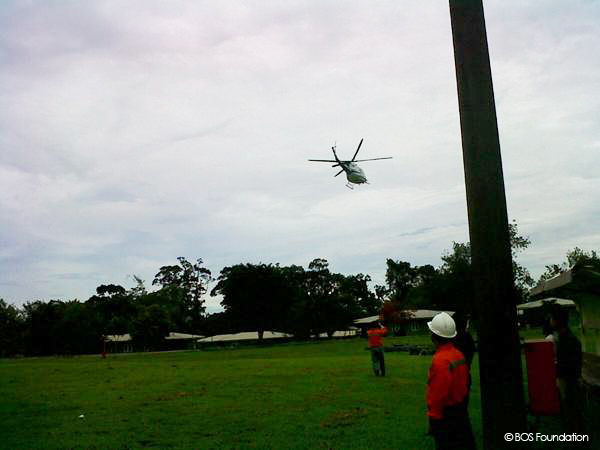 Great care was taken in selecting the site for our helipad to ensure that we did not disturb any natural forest. The final helipad site selected was scrub land which you can see as the light green area on the earlier photo of our campsite location. The team at Nyaru Menteng are equally busy with last minute preparations to make sure everything is ready for tomorrow morning when we move Tarzan, Astrid, Monic and Tantri to the Tjilik Riwut airport in Palangka Raya so they can commence the first step of their journey to Batikap. 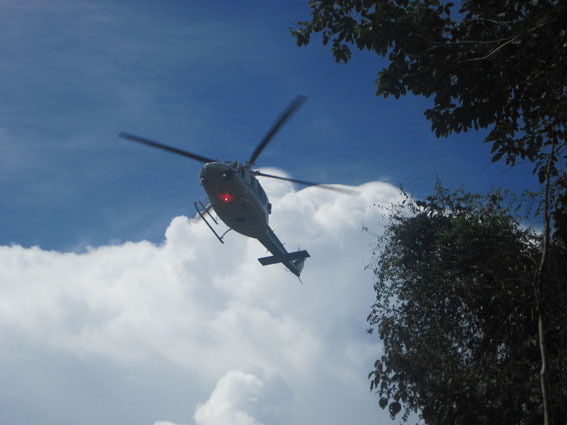 Tomorrow the orangutans will fly from Palangka Raya to Puruk Cahu and after,resting overnight in our enclosure facility in Puruk Cahu, the orangutans will complete the final stage of their journey by helicopter on Tuesday. Tarzan, Astrid, Monic and Tantri are finally going home! Today, all the release team in Nyaru Menteng were so busy preparing all the things regarding upcoming Release Operation. Very tired yet we are very excited!